It provides an enjoyable mode of entertainment on a regular basis, but also gives us opportunities to learn at an accelerated pace. Speaking of learning, video has long been incorporated as an integral element in modern education systems. However, with the expansion of videoconferencing technology –with its capabilities and reliability—the use of video in the context of classroom learning and educational collaboration has taken on a new form. Today’s learning environments now have access to a means of enhancing their educational offerings in novel and intriguingly powerful ways. Videoconferencing technology is opening virtual doors for teachers to better serve their students in ways they were never able to before. Without a doubt, the use of videoconferencing technology in the classroom is changing the landscape of modern learning for the better. Let’s explore a few of the most salient advantages learning institutions, with access to video technology, have at their disposal—as well as the technology's limitations and benefits. Visiting interesting locations can make learning come alive. Not only does it show real world examples of the things students are studying in the classroom but it also helps them to dive further into a subject than simply reading about it ever could allow. Often, failing to deliver on this real-world connection could mean losing the interest of a number of students permanently. Unfortunately, field trips and class excursions aren’t always in the budget and some aren’t even possible because of location. These increasing costs and limited resources can place undue strain on school staff and students' families where field trips are concerned. However, videoconferencing technology in the classroom opens a world of new opportunities for learning and motivation without succumbing to such difficulties. Through videoconferencing technology, schools can offer their students the enhanced learning experience physical field trips provide, without the cost. Having the opportunity to interact face-to-face with experts in any field of interest can help to positively shape a student's future. Having the freedom to interact with multiple experts in a variety of fields on a regular basis can completely change a student's life. However, such privileges have long come with significant price tags and scheduling complications. Through the use of videoconferencing in the classroom, scheduling issues can be sidestepped and prices sliced in half for prospective industry leaders and experts to engage with an interested classroom of students. These experiences can help students gain valuable knowledge and even allow them to discover new areas of interest that could change the trajectory of their life. It can also help relationships develop and give the students connections for future employment opportunities, letters of recommendations and mentorship. Communication between educators and parents is key for student success. Not only should the parents know what is going on in the classroom but it can also be important for the teachers to understand how changes at home could be the cause to a change in the student’s behavior or performance. However, it isn’t always easy for parents and teachers to meet to discuss a student’s progress. With work schedules and other obligations, these meetings can be difficult to schedule in a timely manner. Videoconferencing technology helps to solve this issue by providing a means by which parents and teachers can interact with one another despite disparate schedules and obligations to help the student get the help support they need when they need it. There are many scenarios that place strain on students and teachers alike when it comes to making learning a possibility. Students located in rural areas often must factor in long and costly transportation periods simply to attend school. There are also illnesses and other medical reasons that students may miss lengthy periods of time. These setbacks can lead to poor performance when the student is in class or could even cause them to drop out altogether. Videoconferencing technology presents teachers and students with a solid solution to this important issue - long-distance learning. Videoconferencing is changing education by establishing viable bridges between learning institutions and marginalized students. Students can encounter issues in their learning processes for a vast number of reasons. Not all students can be taught in the same ways and those who learn differently or at a different pace ought not be left behind. Many students who struggle with conventional learning systems can benefit immensely from blended learning techniques. Simply having the option to review recorded classes on video can yield excellent results in such cases, though there are numerous ways for blended learning to be implemented through videoconferencing in the classroom. With all the benefits that videoconferencing offers in education—it seems like an easy call to start implementing it right away. However, we are aware there is some cause for hesitation. It’s possible some educators may not be comfortable adopting the technology. It’s important to understand, though, tailored learning solutions can be developed and technical difficulties avoided through intelligent videoconferencing software design. Beyond user ability, the most pressing issue with bringing videoconferencing technology into the classroom is the upfront cost of it all. Depending on the type of technology chosen, the expense can be significant. However, so too can the reduction in overhead costs down the line. Videoconferencing technology affords learning institutions an opportunity to scale in directions they previously could not. Market opportunities abound for institutions looking to offer affordable learning services online as well as on-premises. Beyond merely opening up new learning avenues to a wide array of students, videoconferencing in education could prove to enhance existing students' learning experiences across the board. This technology allows for students to experience culture and subject matter on a new level. No longer confined to textbooks, important subjects can be taught through creative use of videoconferencing in the classroom. 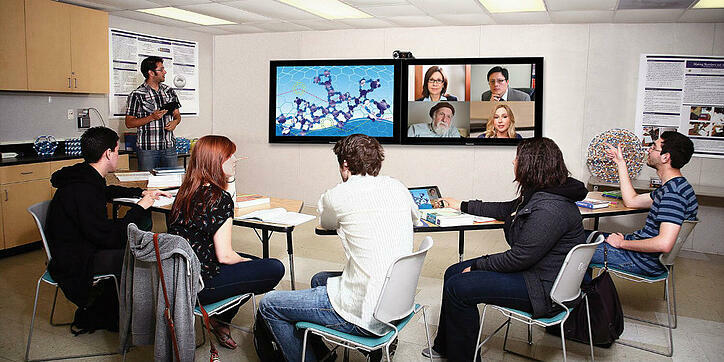 Videoconferencing is changing education - bridging gaps in the traditional offerings learning institutions relied on. The numerous benefits of this technology outshine its limited drawbacks and demonstrate what potential the Internet brings to modern learning. The only question that remains is how else videoconferencing can be employed in formal education to further enhance the learning process.